So ends arguably the most tumultuous, controversial year in the annals of Thoroughbred racing. The sport no doubt is on the brink – of what we don’t quite know yet. But when PETA protests, congressional hearings, synthetic surface studies, steroids, and anti-horse slaughter bills, infiltrate our normally cloistered world and dim our kaleidoscope of vibrant colors you know change is in the air. Most of the sport’s problems in 2008 were initiated within a five-week span, beginning only seconds after the Kentucky Derby and lasting until the final strides of the Belmont Stakes. Eight Belles’ horrific and freakish demise while pulling up after the Kentucky Derby started the firestorm that led to the unfortunate events that followed. A blink of an eye prior to that tragedy, the racing world was prepared to hoist Big Brown onto its most lofty throne. This was the hero, the unconquerable titan everyone had been waiting for. The Preakness put Big Brown on the threshold of history and made us forget about the PETA protests and its preposterous attacks directed at the sport and Eight Belles’ connections. Big Brown’s brilliant victory at least restored some of the sport’s tarnished image and had everyone now talking Triple Crown. Surely, there was no foe even in the same universe as Big Brown. Then it all went wrong during the three weeks leading up to and including the Belmont Stakes, beginning with Big Brown’s untimely quarter crack. The media, mainly those outside the sport, went after Big Brown’s connections like sharks to blood. When they were finished digging through every trash heap they could find, they had made Mike Iavarone and Rick Dutrow look like the James gang. To have it all end in such an ignominious manner with the stretch run from hell put an unsavory end to what had started off as a journey to greatness. Despite the farcical congressional hearings that followed, there were many memorable and passionate moments, with Curlin, Zenyatta, and Peppers Pride all gathering large fan bases across the country. Even though Big Brown returned to win two stakes before his untimely retirement, many fans just couldn’t see past his Belmont calamity and their perceived view of his connections. Now, here we are about to embark on what promises to be another turbulent year. Racing did make great strides as a result of the events of 2008, and we can only hope it continues to move forward – both from a fan’s and a bettor’s standpoint. The sport has lost the majority of its print journalists, but perhaps we can get many of them back if we can find people who know how to sell and market the product effectively. So, here is one goal: find a way to get Sports Illustrated to actually write a positive article on racing. If we can do that, then perhaps the newspapers will follow. Isn’t it about time we CAN explain it (better still not have anything to explain), just so we can inform the rest of the world we know what we’re doing, especially when we wind up re-living the same problems as last year at this time on the Cushion Track? Did we perhaps act too quickly in rushing into synthetic surfaces without knowing as much about their complexities and idiosyncrasies as we should have? I loved watching horses run in safety in the Breeders’ Cup, but there apparently is an instability and quirkiness to some of these surfaces we know little about. This is what the horsemen voted for, so let’s make our first New Year’s wish that the Pro-Ride surface return to the way it was last fall and that the maintenance people discover what went wrong and fix it…for good. Also receiving votes were Zayat Stables, Hal Earnhardt, Roy and Gretchen Jackson, Marylou Whitney, Gary Tanaka, Tommy Kelly and Joe Grant, and Ken and Sarah Ramsey. Even Old Friends’ Michael Blowen, who doesn’t own horses, received a vote. Oddly enough, to demonstrate the fans’ perception of what an Eclipse Award-winning owner should be, Frank Stronach, the leading owner in the country by money won, did not receive a single vote. Based on their explanations, voters determined that Jess Jackson deserved the award for keeping Curlin in training as a 4-year-old; Joe Allen deserved it for his handling of his homebred sensation Pepper’s Pride; Jerry and Moss for their class and all they’ve done for the sport, not to mention their handling of Zenyatta and Tiago; and Rick Porter mainly for the way he dealt with the Eight Belles tragedy and stormy aftermath. So, four of the top five finishers were based mostly on the owners themselves and their contributions to the sport rather than their actual accomplishments over the course of the year. One note about the actual Eclipse voting: The new online format has to change, because it shortchanged IEAH, and could very well cost them any shot at winning the award. The only listing for them on the drop-down part of the ballot is for IEAH Stables and Paul Pompa, meaning that it is strictly a vote for Big Brown’s owners, which many will be reluctant to do based on one horse. This ignores all the other horses IEAH owned with different partners. Not many are going to take it upon themselves to “write in” just IEAH Stables. Unless the NTRA combines IEAH and Pompa and IEAH as a write-in, they will have a split vote. The listing of IEAH and Pompa is based solely on the fact that they are the only ones who made the top 20 list of money-winning owners, and they were at No. 20. As for Jess Jackson, the vast majority of voters said it was his keeping Curlin in training at 4 that earned him their vote. In today’s racing world, with its fans starving for some semblance of longevity from its heroes, that explanation certainly is acceptable. Those who have been around for a while remember not too long ago when it was unthinkable not to keep a horse in training at 4. But times have changed, due mostly to the obscene offers from breeders and a different class of owner. Gone are the private stables run by sportsmen who bred their own horses and took great pride and pleasure in seeing them race for several years. They have been replaced by mostly businessmen with a profit-first mentality. You can’t criticize someone for wanting to make money, so you just have to accept the new order of things. Jackson’s decision also was magnified by the early retirements of Street Sense, Hard Spun, and Any Given Saturday, and Curlin’s retirement would have totally decimated the 2008 4-year-old crop. Just try to imagine the older horse division without Curlin. In fact, try to imagine what the 2009 older horse division will be like without a star of his magnitude. Some stated they did not vote for Jackson in the belief that his motives were not done in the nature of sportsmanship, but being in a precarious legal situation surrounding ownership of the horse. No one can get into Jackson’s head, so you either believe that or you don’t. Whatever the real reason, he did keep him in training and plotted an ambitious and uncharted course for Curlin. And when that didn’t work out, he went against his initial instincts and ran him in the Breeders’ Cup Classic on a synthetic surface, something he vowed all year he would not do. To say he did it for the good of the sport and for the fans sounds trite, but what other reason can there be? When Big Brown was injured it was left to Curlin to carry the entire load on his shoulders. Despite the way it turned out, try once again to imagine the Classic without Curlin. It would have been an awfully dark sky over Santa Anita with both those stars missing. And Jackson sent him there a month in advance, giving the Santa Anita fans plenty of opportunities to see the horse, especially when he worked in company between races. Therefore, Curlin’s impact on the Breeders’ Cup transcended his fourth-place finish, and that was because of Jackson. As for Joe Allen, it doesn’t seem as if his votes were directed at anything specific he did other than his handling of Peppers Pride over the course of her career and racing her after she had broken the unbeaten record held jointly by Cigar, Citation, and Hallowed Dreams, and Mister Frisky in Puerto Rico and the United States. Allen’s second-place finish appears to be the voters’ way of recognizing the filly’s extraordinary feat, which was accomplished over several years, not just 2008. She is not going to win any Eclipse Awards, nor is her trainer. So why not honor her through her owner? I could be wrong, but that’s just the way I interpreted the large number of votes he received. Again, in this day and age, you can’t find fault with that reasoning. Jerry and Ann Moss? In the world of owners and breeders they are gods, so no reasons are necessary. To have someone as high-profiled in the outside world as Jerry Moss be as passionate about racing as he and Ann are is a major boost to the sport, and we should just bow in their presence. They are the epitome of the word class. And they hired a trainer and racing manager just as classy. When was the last time you saw a trainer and racing manager so compatible they married each other? Again, I wish to thank everyone who voted. 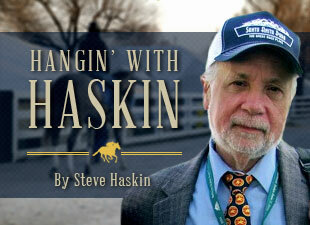 It made for some fascinating and lively discussion, and showed just where the mindset of the racing fan is these days. I must for the last time bring up the subject of Big Brown, who was caught in a maelstrom and swept away from the hearts and minds of many of his fans. Only in his two trips to Monmouth Park did he receive the love that had been lavished upon him earlier in the year. Having been involved in Thoroughbred racing for 40 years, I can count on my two hands the number of horses that had what the old-timers used to call “The Look of Eagles.” It is something indefinable, but you know it when you see it. It’s the stuff of movies and books…and legend. For whatever it’s worth, Big Brown was one of those rare Thoroughbreds that had the look of eagles. Forget about the Belmont Stakes and the supposedly inferior competition he faced all year (although five horses did come out of the Kentucky Derby to win grade I stakes last year, and the two older horses he defeated on the grass came back to win the grade II San Gabriel Handicap and finish second in the grade I Shadwell Mile). This is strictly about the horse’s presence and the aura around him. There was true greatness in Big Brown. But unfortunately, his script was never completed, due mostly to bad feet and one inexplicable, nightmarish afternoon in early June. And make of his connections what you wish. That has no bearing on any of this. Who knows how differently the story would have played out had it not been for Eight Belles’ death. For the first time in history, the lustrous glow of the Kentucky Derby spotlight was dimmed by tragedy. Some of the feats Big Brown accomplished likely will never be duplicated. And it is those feats that should be remembered above all else. This is not meant to convert his detractors or make a case for him as Horse of the Year. Curlin and Zenyatta are both worthy recipients of the honor. The only point I’m trying to make is that you had to be around Big Brown to fully appreciate just how special he was. Only then could you witness for yourself the look of eagles.